Originally uploaded by Johnny Vulkan. I never realized where I sought my worth and value until I experienced the worth of being valued. Where I sought it and where it came from were two utterly different places that couldn’t be more opposite. Along these lines, when I consider what it means to live a good life I have equated that with the amount of good a life has done, with the quality of how the life was lived. 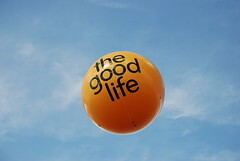 What if the measure of a good life was none of those things, at least, none are the core of the measurement? What if a good life had more to do with what some one else said about you as a person who is alive? And the outcome of what they said was a life lived well, not the other way around? Our world measures value, worth, and good living by the things we have, or don’t, the people we help or don’t, the kind of family we came from and the one we make for ourselves, for others. What if that had nothing to do with it at all?